Read about how the latest addition to the OGO family came to be. A lot of work goes into building the perfect OGO track. Thankfully we’re the best in the business and know exactly what to do to make the best (and safest) tracks e ver! Before you can build a track, you first need an idea! Lots of brainstorming, picture drawing and discussion goes into conceptualising what a new track might be, this is done by Andrew and Dave (the inventors) and Kelly our GM who collectively have about 250 years of down hill balling rolling experience! From there, there is lots walking up and down the hill to scope out the perfect location, terrain and what the ride will be like. The track is then marked out and ready for the fun part – some digging action. When we were planning Big Air, we knew we wanted the very best to bring our track idea to life, so we called our buddy Adam from Empire of Dirt, the same dude who dug out the MEGA track for us last year. These Rotorua guys are pretty cool! 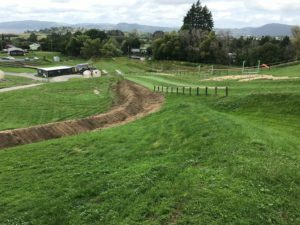 With experience in building mountain biking trails around the world including Crankworx Rotorua, Empire of Dirt is easily one of the world’s leading mountain bike trail construction businesses. We knew we were in safe hands! They also enjoyed working on a project that was a little bit different from Mountain Bike Trails. As they are in such high demand, Adam had a very short time frame to get Big Air completed, before moving onto his next project – some other awesome MTB track is some exotic location no doubt! With plenty of early starts and late finishes Adam had Big Air dug and ready for some grass action within a week – what a legend! We don’t like to br ag, but we think of ourselves as grass connoisseurs around here, after all we are surrounded by the stuff. Unfortunately, watching grass grow is about as much fun as watching paint dry. 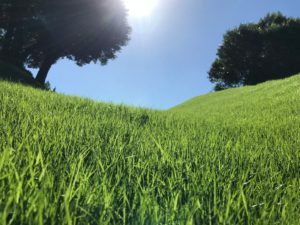 Thankfully we had plenty of rain over Autumn and Winter to help the grass grow thick, lush and green. Just how we like it! The next step in building Big Air was extensive track testing. Using a barrel filled with water to mimic a person inside to see how the OGO would roll down the track. Once we were sure it was safe for humans we the conduct some crew testing, because no one knows our tracks better than our crew! Once the boys (Andrew, Dave and Kelly) are happy and the OGO test regime is complete, Big Air was ready for paying customers to experience. Big Air was always going to be special and this is a very different track from all our other OGO tracks. A super steep hill, winding chicane and two massive drops in the middle offer the ultimate thrill ride and as the name suggests, you get some Big Air! Our favourite part is that funny squiggly tummy feeling you get when you plummet over the big drops! This is the ultimate thrill ride, the most extreme OGO track to date and we can’t wait for you to join us to give it a go … if you dare!